The news is all atwitter about our current drought being the driest in the last 1,200 years, based on some blue oak tree ring samples. Let see what some of the climate history has to say. As you can see in the chart below, that in Northern California 1923-1924 and 1976-1977 were much drier than the years 2013-2014 and in the 2014-2015 year, we are about on track for an average year. The above chart is up to December 7th. Since then the northern end of the state has received 4-6 additional inches of rain and several feet of snow at higher elevations. We may be a little above normal. Let’s hope this stays above normal. 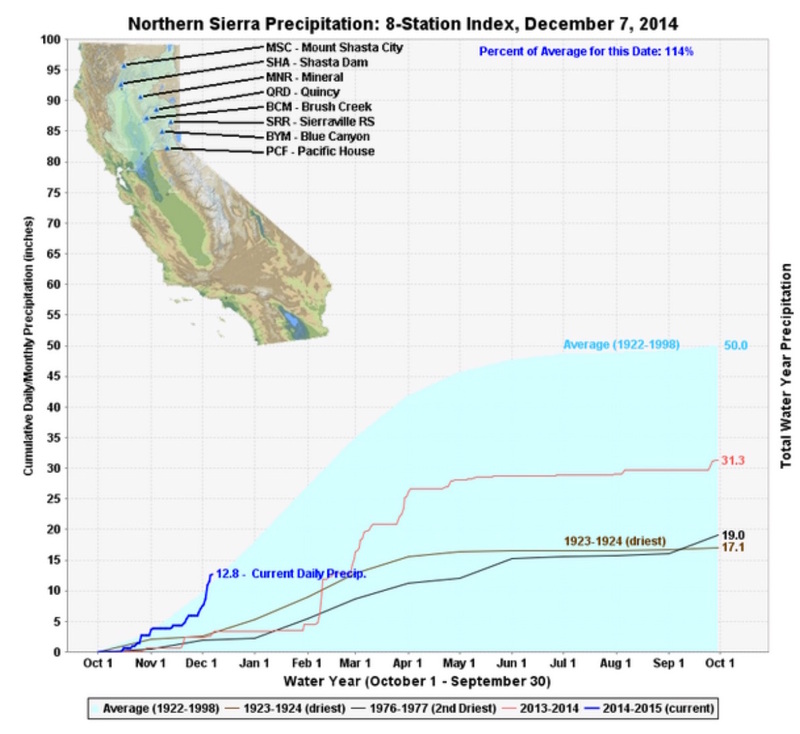 This entry was posted in Analysis, California, Climate, Drought, Weather. Bookmark the permalink. Natural weather patterns, not man-made global warming, are causing the historic drought parching California, says a NOAA study out Monday. “It’s important to note that California’s drought, while extreme, is not an uncommon occurrence for the state,” said Richard Seager, the report’s lead author and professor with Columbia University’s Lamont Doherty Earth Observatory. The report was sponsored by the National Oceanic and Atmospheric Administration. The report did not appear in a peer-reviewed journal but was reviewed by other NOAA scientists. “In fact, multiyear droughts appear regularly in the state’s climate record, and it’s a safe bet that a similar event will happen again,” he said.